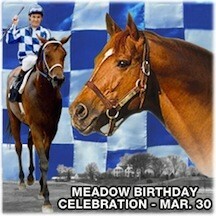 We are happy to announce that our full-time narrated tours of The Meadow, Secretariat’s birthplace, will resume in March 2015. Read more about the narrated farm tours here. If your group is interested in a tour, please contact Leeanne Ladin, author/narrator, at laladin@verizon.net.